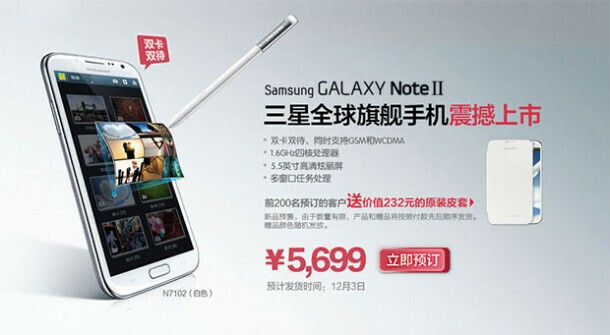 We knew that a Samsung Galaxy Note II with two SIM card slots is coming to China soon to integrate the country's different mobile network technologies in one heck of handset, and here it is official. 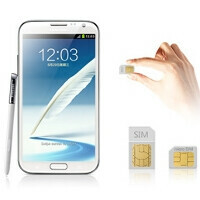 To sweeten the pot, Samsung has added a regular SIM card slot to the micro SIM one that is in everyone else's Note IIs, and the radios inside support dual standby mode for "GSM 850/900/1, 800/1, 900 MHz and WCDMA 850/900/1, 900/2100 MHz" frequencies simultaneously. Given the popularity of dual or even triple SIM phones in China - this 5,699 yuan Note II takes care of it all. The price translates to $915 unsubsidized, though, so all that extra connectivity inside doesn't come cheap. dual sim phone was born in china and china is the biggest cellphone market right now. that's why. Seems useless for someone like me, but I suppose they did it for a reason. China seems to have a lot of different dual-sim offerings. ok every story I see about SIMs I ignore since I was with Sprint for 11yrs. Just left Sprint for Verizon and had a SIM in my phone. Someone fill me in on what the SIM is for please. Depends on which carrier you are on Time to see the world American!! it's the number people use to call your handset.